THE PICKIEST EATER IN THE WORLD: HOLIDAY INN MAKATI: BURGER BAR WEEKENDS AT FLAVORS! HOLIDAY INN MAKATI: BURGER BAR WEEKENDS AT FLAVORS! Its no secret that I am a burger fanatic. I love experimenting with different toppings, trying to find the combination that best suits my palate. What if I told you there was a place where you could enjoy an unlimited amount of burgers that you customized to your own heart's desire? And not only that, you get a full on buffet that includes a wide array of American Classic Dishes such as BBQ Ribs, Ribeye Roast, and a vast selection of desserts to choose from? 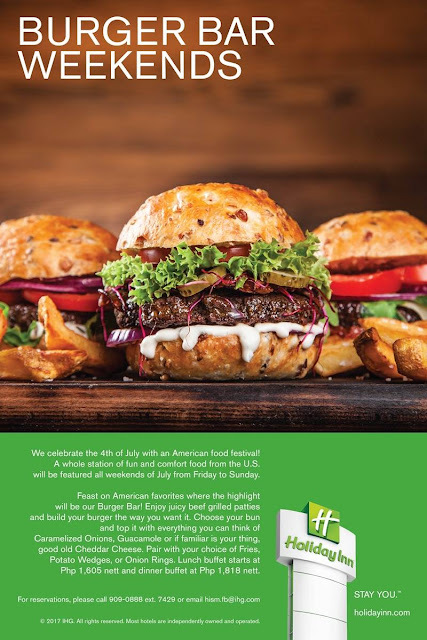 Yes my friend, a place on Earth does exist.. And The Burger Bar weekends happens every weekend of July at Flavors, Holiday Inn Makati. This was another epic meal for me. The burgers of Flavors was exceptional, and I would love to go back soon! You must not miss this buffet!!! Like Holiday Inn & Suites Makati on Facebook!